Christmas can feel a touch overwhelming, can’t it? You might be scrambling to get last minute gifts, or preparing food for company coming from out of town, all the while trying to keep up with work demands. When Christmas finally comes, it’s easy to feel overwhelmed and exhausted by the chaos. Mary and Joseph had a bit of their own chaos. 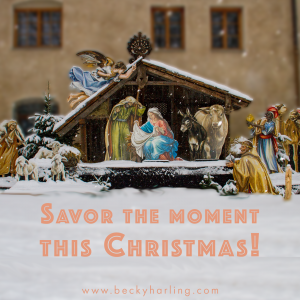 They weren’t rushing to a Roman mall hunting for an ornament that said “Baby’s First Christmas” for Jesus, or scrambling to put up a tree, but they did have to deal with unexpected company—a troop of dirty shepherds who arrived soon after Mary delivered Jesus. I’m pretty sure Mary felt exhausted after giving birth in a stable without an epidural. Just when she was trying to get some rest, in comes a group of smelly shepherds who had seen a host of angels and were undoubtedly excited and noisy because of what they had experienced. Scripture tells us that after they saw baby Jesus, they were so excited they began telling everyone what they had seen (Luke 2:17). Mary could have resented the intrusion. Who would have blamed her? But instead she chose to “treasure” (Luke 2:17) the entirety of the experience. The word treasure that’s used in this scripture speaks to keeping something close to your heart—in other words, savoring the moment. That’s a great lesson for us! Let go of the need for an elaborate dinner. For years I made a huge Christmas dinner, even though we had late Christmas Eve nights with services. Half the time, my kids would wolf down their dinner and go to play with their presents. It’s honestly taken a long time for me to move past this. Decide ahead what dishes are important for tradition, and then prepare them ahead of time. Involve family members in the cooking so you can all enjoy each other while you prepare. If you have small children, don’t be afraid to use disposable plates. That way you can be present with your kids rather than focused completely on cooking and cleaning. Have a few questions in mind to ask your family. Christmas is a wonderful time for conversation. Ask your family or friends about stories of Christmases past. Ask them about favorite memories from their past or about how they coped when money was low. Ask them what their favorite part of the Christmas story is and why. Be creative! By drawing your family and friends out, you’ll stay engaged, and they’ll feel heard and loved. Create the space to spend a few quiet moments with Jesus. Thank Him for entering our dirty, chaotic, violent world so that you might have a relationship with God the Father. That might mean getting up a few minutes before your family or grabbing a few minutes mid-day when others are distracted. In your moments with Jesus, ponder: God became a child so that you might become a child of God. It’s absolutely crazy, and in many ways it doesn’t make sense! Treasure the truth this Christmas. When you feel overwhelmed—Pause. Breathe. Reflect. Savor. Jesus came for you. Lord, help me to be present this Christmas. Show me what it looks like to savor the moments with my family and friends, but most of all show me how to be fully present to You!